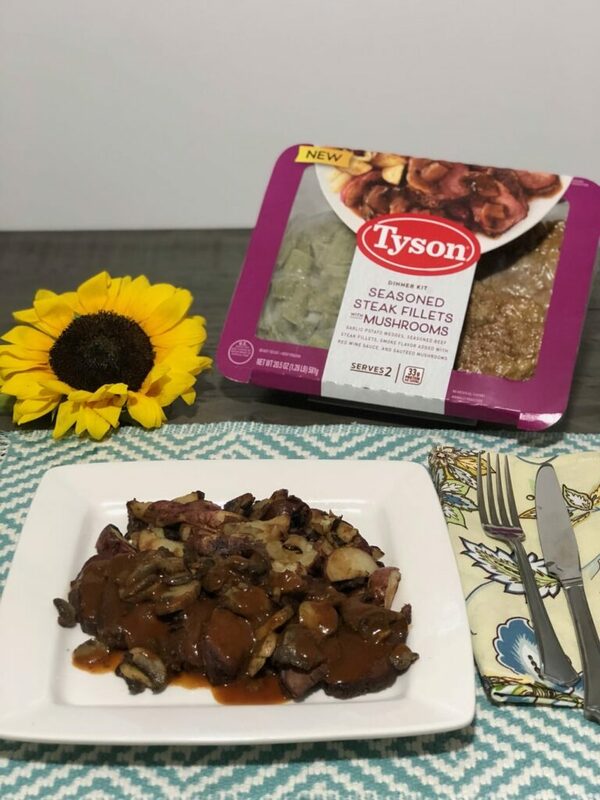 Enjoy a quick and delicious dinner with Tyson® Fully Cooked Dinner and Entrée Kit that can be purchased at Albertsons. Meal kits and meal delivery services are popping up all over and with good reason. When you factor in the shopping and the prep time, more of us are realizing they are a fantastic solution. However, those home delivery meal kits can be pricey. My regular readers know that as of last year, my husband and I are empty-nesters. It is strange to see the refrigerator half-full now that we don’t have a house full of hungry kids and their friends. At first, cooking for two was a bit challenging. I kept buying too much food out of habit. I started to try some of the home delivery meals where the portion sizes were great but since I am a frugalista, the cost per meal and the planning ahead that is needed, was not a great fit. Our weeknights are busy and we often don’t get to eat together despite our best intentions. Most weeknight evenings, one of us has an activity. On the weekends, family and friends will often drop by and then we will plan a bigger meal, barbeque or go out to eat together. Are your weeknights busy too? I am finding these fully cooked kits to be the perfect meal for us, especially during the week. They are already prepped and pre-portioned! You are probably already familiar with Tyson, they have been a trusted brand in our home for many years. 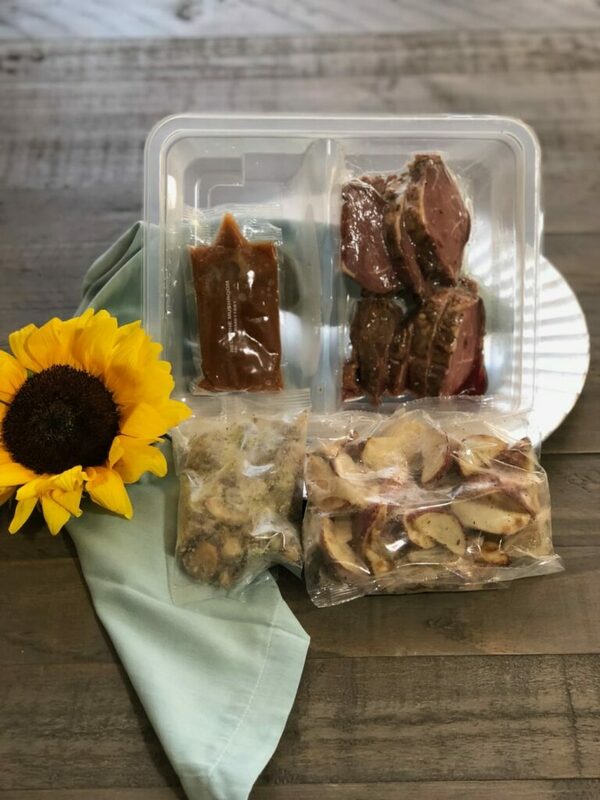 These Tyson Fully Cooked Dinner and Entrée Kits are made with proteins and the Dinner Kits have vegetables that are prepped and portioned, then frozen at the peak of freshness. There are no artificial flavors and the meals are minimally processed. 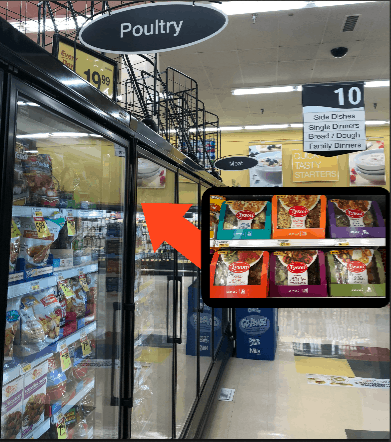 The high-quality meat is fully cooked and vacuum-sealed into tray without any freezer burn and their all natural* Tyson chicken is raised with No Antibiotics Ever. 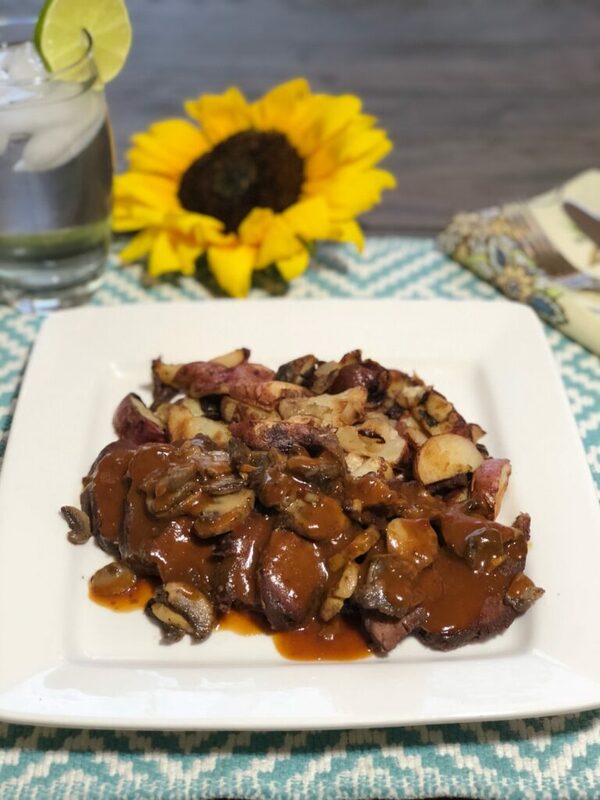 This Mushroom Steak Fillet Dinner Kit brings a hearty and flavorful meal to any plate with pre-seasoned beef fillets, garlic potato wedges, sautéed mushrooms and smoky red wine sauce. Take the difficulty out of dinner with this frozen meal kit that’s pre-portioned, fully cooked and ready in less than 25 minutes. 1. If beef is frozen together, microwave for 25 seconds in the tray or on a plate until it separates. 2. Add steaks to an unheated skillet with 1 Tbsp. oil. Heat uncovered on medium-high for 5 minutes. Turn steaks and cook for an additional 2 minutes for medium, or 4 minutes for well done. 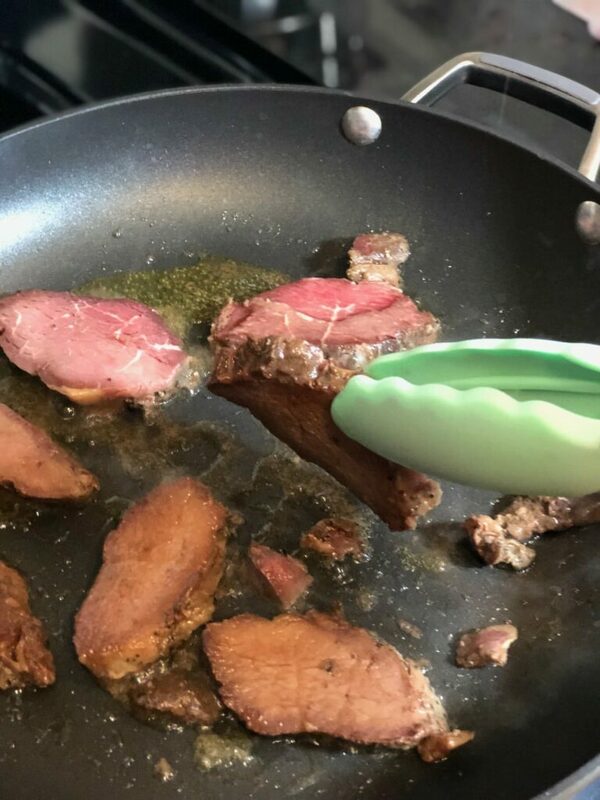 Remove steaks from skillet and plate. 3. 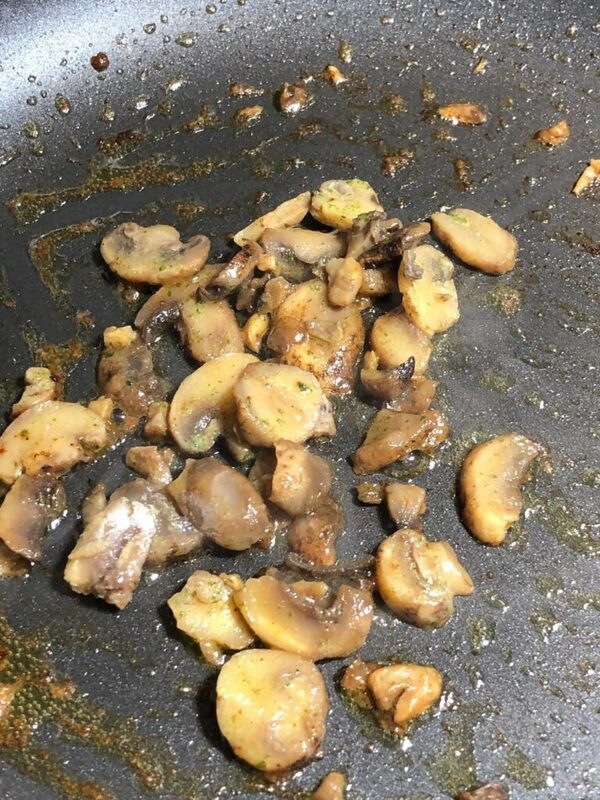 After steak is removed, add mushrooms to skillet and cook 2 minutes on medium heat, stirring frequently. 4. 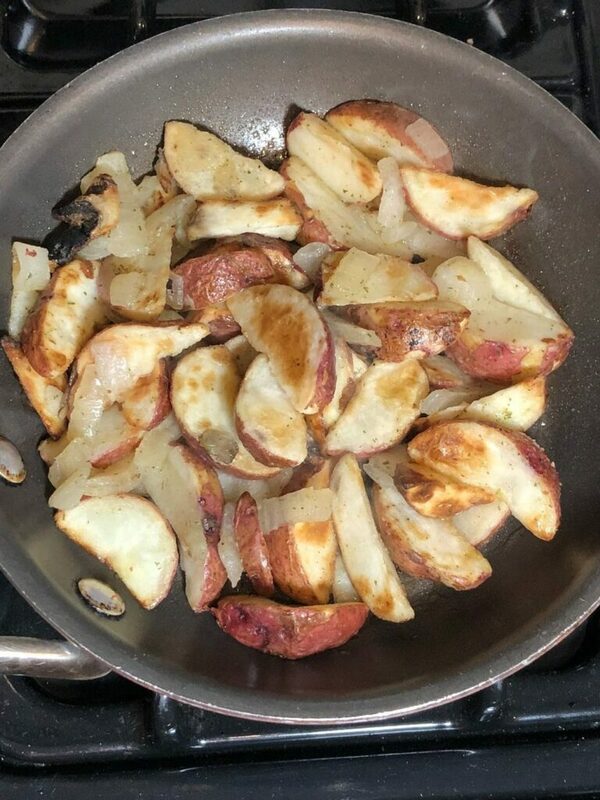 While steak is heating, add potatoes to a second unheated skillet with 1 Tbsp. oil and 1 Tbsp. water and cover. Cook on medium for 5 minutes. Remove lid, continue to cook for another 3-5 minutes, stirring occasionally. 5. Tear a notch in sauce packet to vent. Place upright in a container and heat in microwave for 45-60 seconds or until hot. 6. Plate potatoes with steak. Top steak with mushrooms and pour sauce over steak as desired. 7. Cook potatoes thoroughly to an internal temperature of 165 F.
I told you it was quick! Dinner is served. 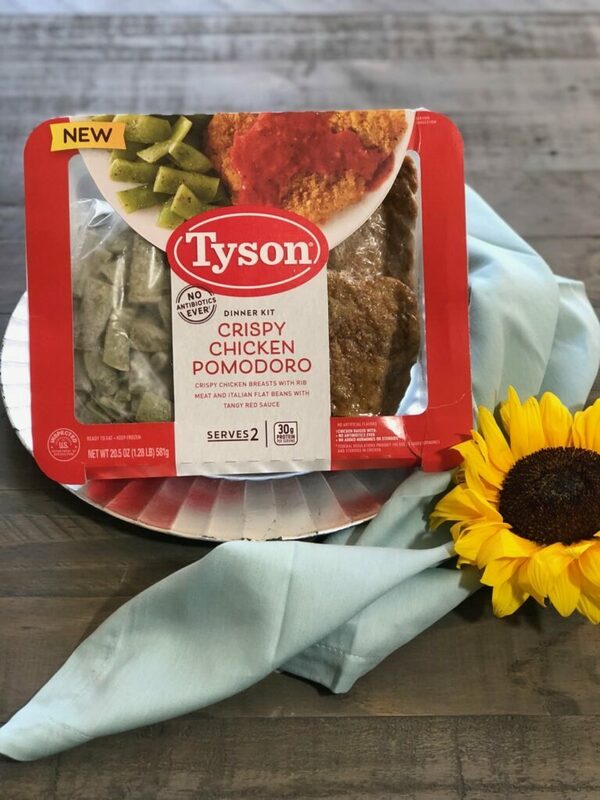 Find Tyson Fully Cooked Dinner and Entrée Kits in the freezer aisle at Albertsons and save even more with this digital coupon now through 9/30: $2 off any ONE Tyson Fully Cooked Dinner or Entrée Kit.